Director – Gordon Hessler, Screenplay – Brian Clemens, Story – Brian Clemens & Ray Harryhausen, Producers – Ray Harryhausen & Charles H. Schneer, Photography – Ted Moore, Music – Miklos Rozsa, Visual Effects – Ray Harryhausen, Production Design – John Stoll. Production Company – Morningside. Sinbad fires an arrow at a strange creature that flies over his ship, causing it to drop the amulet it is carrying. Ashore, the sorcerer Koura attempts to forcibly take the amulet from Sinbad. Sinbad is granted refuge by the benevolent ruler of the city, the Grand Vizier, who has been forced to hide his face behind a beaten gold mask after Koura burnt it with a fireball. The Vizier shows Sinbad a companion amulet and the drawing of a third one. All three form a map that leads to a fountain of youth on the island of Lemuria. With the complete amulet, The Grand Vizier will be able to stop Koura’s ravages on the kingdom. And so Sinbad and the Vizier set sail on an expedition to Lemuria. However, Koura desires the amulet too, wanting to regain the youth that each spell he casts steals from him, and sets sail determined to stop them. 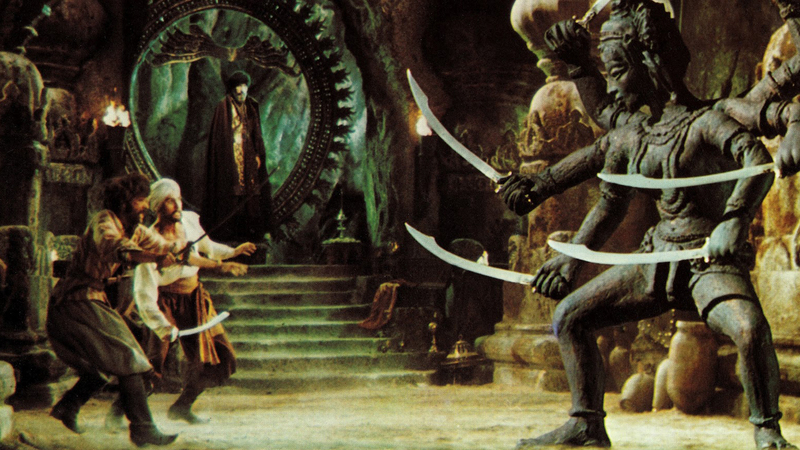 The 7th Voyage of Sinbad (1958) was a landmark in fantasy cinema. It was often imitated over the next decade. Most importantly, it brought to prominence the name of special effects man Ray Harryhausen and his fantastical creatures. Ray Harryhausen was a specialist in the process of stop-motion animation where models are meticulously moved and photographed one frame at a time. Harryhausen went onto a substantial career over the next two decades, creating similar flights of fantasy. (See below for Ray Harryhausen’s other films). He would revisit the Sinbad mythos twice, here and later with the disappointing Sinbad and the Eye of the Tiger (1977). The Golden Voyage of Sinbad is one of Ray Harryhausen’s most acclaimed works and one that shows him at the height of his art. 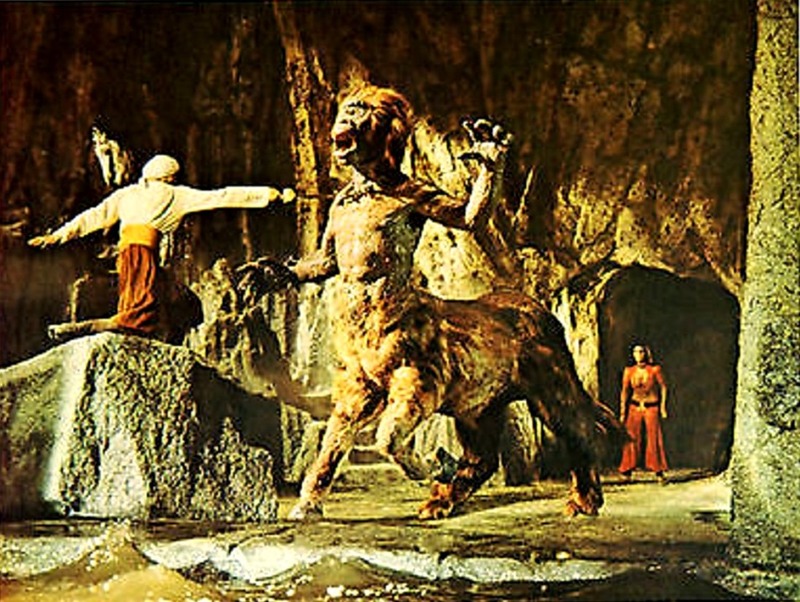 With The Golden Voyage of Sinbad, Ray Harryhausen employed director Gordon Hessler, who emerged out of the English horror cycle in the late 1960s (see below for Gordon Hessler’s other titles) and Brian Clemens on script. Brian Clemens had worked as script editor on tv’s The Avengers (1962-9), wrote a number of films during the English horror cycle and went on to create series such as The New Avengers (1976-8), The Professionals (1977-83) and Bugs (1995-8). (See below also for Brian Clemens’s other titles). Most Ray Harryhausen films tend to be set around Harryhausen’s provision of creature effects, with the intervening action being stolid and his leading men tending to a uniform woodenness. Although the dialogue here has a tendency to fall in clunky pseudo-profound aphorisms at times, Brian Clemens creates probably one of the more nuanced scripts for any Ray Harryhausen film. Particularly original is the character of the sorcerer Koura who ages every time he casts a spell. Brian Clemens and Ray Harryhausen also plunder world mythology somewhat indiscriminately, ending up with what often seems a peculiar multi-cultural polyglot – there is Kali from Hindu religion, a griffin and combination centaur/cyclops from the Greek myths, the homunculus from mediaeval alchemy, Lemuria (an idea that was posited by biologist Ernst Haeckel in the 1870s, preceding the notion of continental drift, of a sunken land in order to explain how lemurs managed to get between Africa and India and one that was quickly appropriated by the 19th Century Theosophist movement), and of course the backdrop from the Arabian Nights cycle. This is the less important than the spectacular beauty of Ray Harryhausen’s various set-pieces which, by this time, were at the absolute peak of their form. Harryhausen offers us a six-armed statue of Kali brought to life in a sword-duel; a to-the-death battle between a griffin and a cyclopean centaur; a magically animated ship’s figurehead; and, best of all, the homunculus that Tom Baker brings to life, teasing and prodding it, as it lies pinned to a table. The Golden Voyage of Sinbad is also notable for many of the up-and-coming stars. There is Tom Baker who, the following year, would become the fourth incarnation of tv’s Doctor Who (1963-89) (and apparently won the part after the producers of the show saw him in Golden Voyage; cult queen Caroline Munro; and Martin Shaw, later hunk hero of Clemens’ superior action man tv show The Professionals. Ray Harryhausen’s other films are:– The Beast from 20,000 Fathoms (1953), the granddaddy of all atomic monster films; the giant atomic octopus film It Came from Beneath the Sea (1955); the alien invader film Earth Vs. The Flying Saucers (1956); the alien monster film 20 Million Miles to Earth (1957); The 7th Voyage of Sinbad (1958); The 3 Worlds of Gulliver (1960); the Jules Verne adaptation Mysterious Island (1961); the Greek myth adventure Jason and the Argonauts (1963); the H.G. Wells adaptation The First Men in the Moon (1964); the caveman vs dinosaurs epic One Million Years B.C. (1966); the dinosaur film The Valley of Gwangi (1969); Sinbad and the Eye of the Tiger (1977); and the Greek myth adventure Clash of the Titans (1981). Brian Clemens’s other scripts are:– The Tell-Tale Heart (1960), Curse of the Voodoo/Curse of Simba (1965), And Soon the Darkness (1970), See No Evil/Blind Terror (1971), Dr Jekyll and Sister Hyde (1971), the Disney ghost story The Watcher in the Woods (1980) and Highlander II: The Quickening (1991). Clemens also wrote and directed Hammer’s Captain Kronos – Vampire Hunter (1972). He has acted as script editor and producer on the tv series’ The Avengers, The New Avengers, The Professionals and Bugs. Gordon Hessler’s other films are:– The Oblong Box (1969), Cry of the Banshee (1970), Scream and Scream Again (1970), , Murders in the Rue Morgue (1971), The Strange Possession of Mrs. Oliver (1977), Kiss Meets the Phantom/Kiss in the Attack of the Phantom (1978) and The Girl in a Swing (1988).